When Linda and I were first certified as Private Pilots it was my intention to build a kit aircraft , but this didn't please Linda. It wasn't because she didn't want me to build an airplane or objected to flying an airplane that I had built, but because it would take me several years to complete the project. She wanted us to buy an airplane so we could immediately start having flying adventures. "Well okay," I said "We'll buy an airplane." ;- ) A few weeks later we became the proud owners of a vintage Cessna. 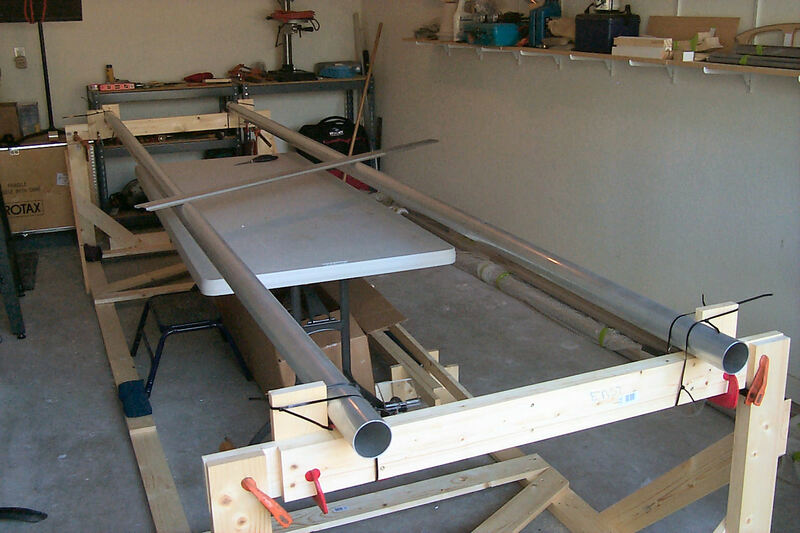 As the years progressed we grew to love our airplane and have worked hard to keep it in good condition, however, I never lost the urge to take on the challenge of building an airplane from a kit. 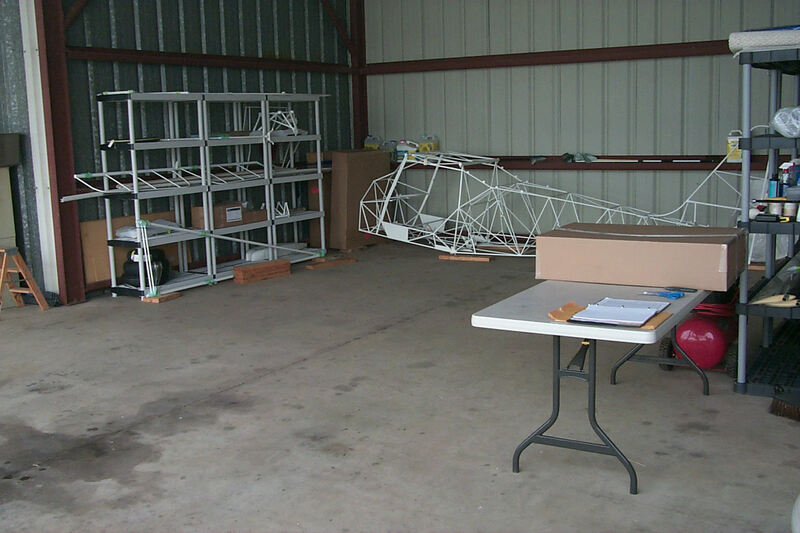 On the second of June, 2009 we placed an order for a Kitfox Super Sport. As much as there could be any practical reason for owning an airplane there are some good reasons for owning a Kitfox. First, after taking a careful look at our flying habits we determined that the vast majority of our trips are with just the two of us and from 10 to 60 pounds of luggage. In spite of only having seating for two the Kitfox will do most everything that we are presently doing with our Cessna. Also, when the Kitfox is complete and has taken the place of the Cessna, our operating and maintenance costs will become significantly less. This will make it an ideal airplane to have during the time of our lives when both of us want to curtail our work commitments. 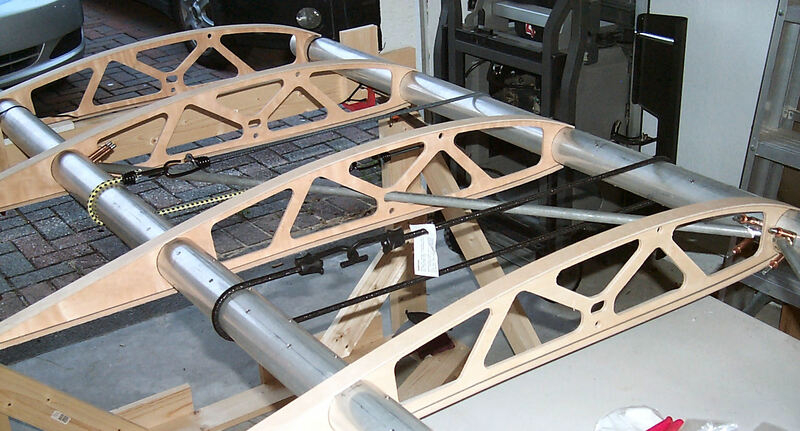 The Kitfox Super Sport kit is manufactured by Kitfox Aircraft LLC of Homedale, Idaho. 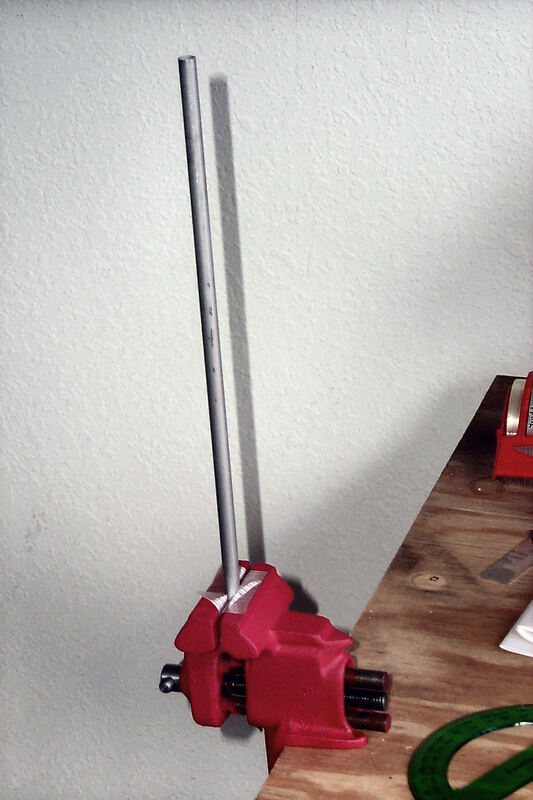 We will be driven by a Whirlwind GA-RW3B 70" three blade, ground adjustable propeller. The Kitfox Super Sport can be built using either conventional or tricycle (nose wheel) landing gear. 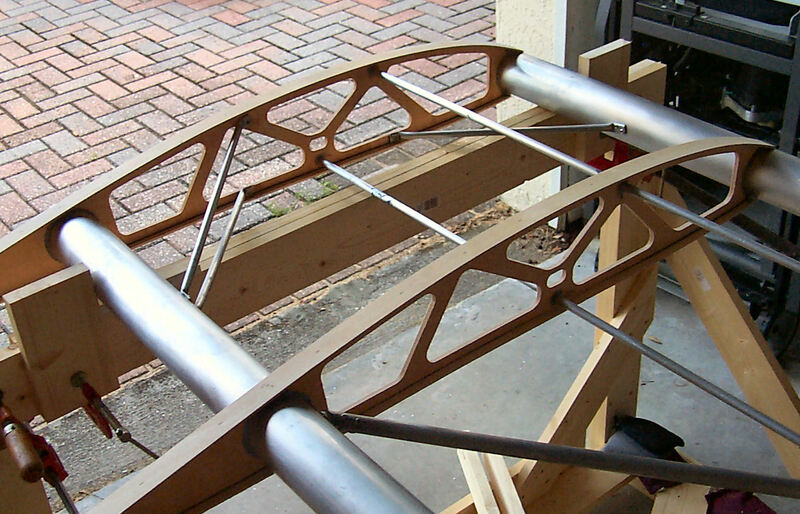 Our Kitfox will feature a tricycle configuration. N673LT is our tail number. Demonstration Flight: On the day we placed our order Linda and I had traveled to Idaho to meet with John and Debra McBean, the owners of Kitfox Aircraft. John was kind enough to give both of us an opportunity to fly a Kitfox Super Sport. Our impression was that it is a very nimble airplane that is also well mannered. Something that offers great fun doing local flights with lots of maneuvering but is also stable enough for long cross-country flights. Quick Links! Latest Update on 11 July 2017. 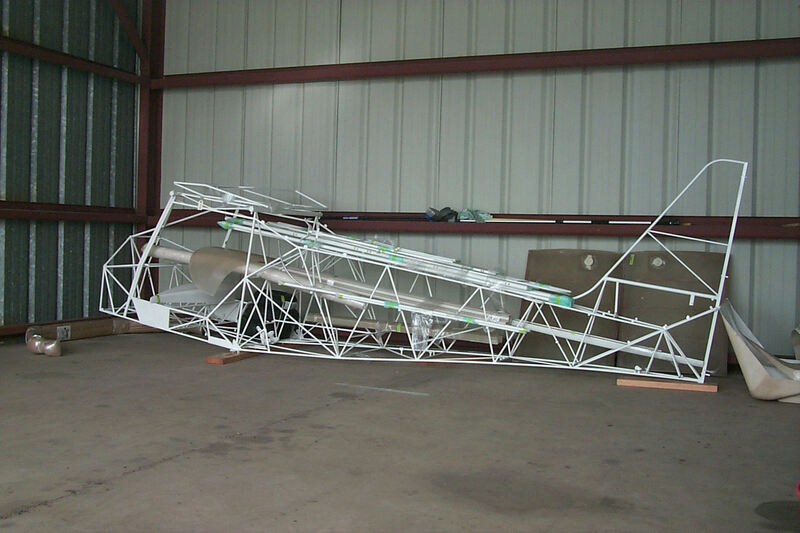 New 13 March 2012: We purchased a Whirlwind GA-R3B 70" three blade, ground adjustable propeller. New 12 January 2012: Construction drawings of my Wing "Rotisserie"
26 August 2009: The Kit Arrives! Partain Trucking is a company that specializes in transporting kit planes and they did an excellent job of delivering our kit right to the hangar door. 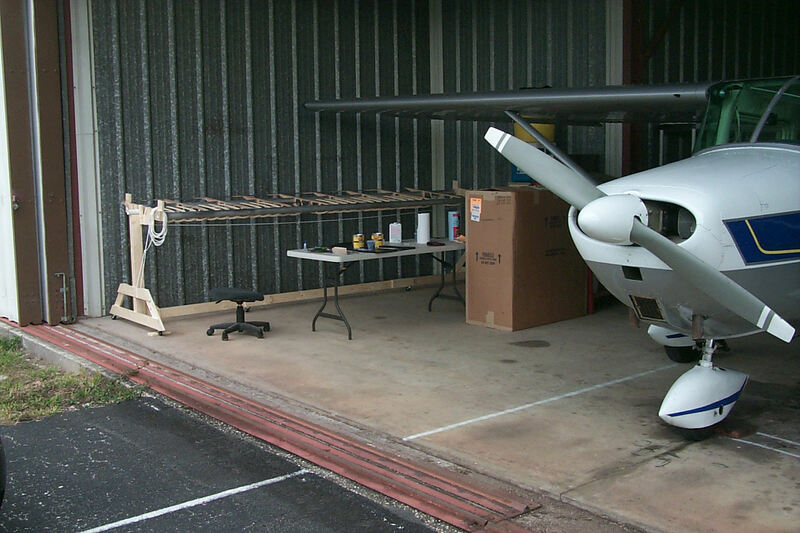 As you can see in the second photo the major portion of the kit fits in the T-hangar nicely behind the Cessna. 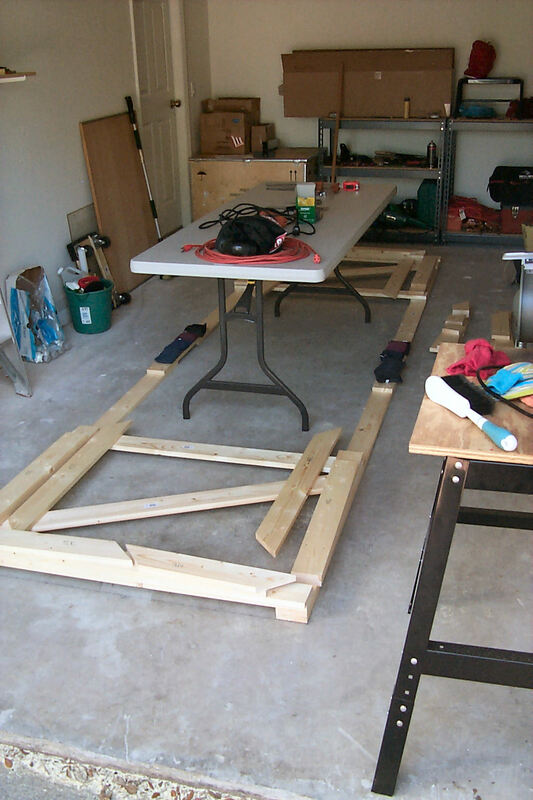 Builder's Log: As part of the registration process we have to document that the airplane is at least 51% amateur built. 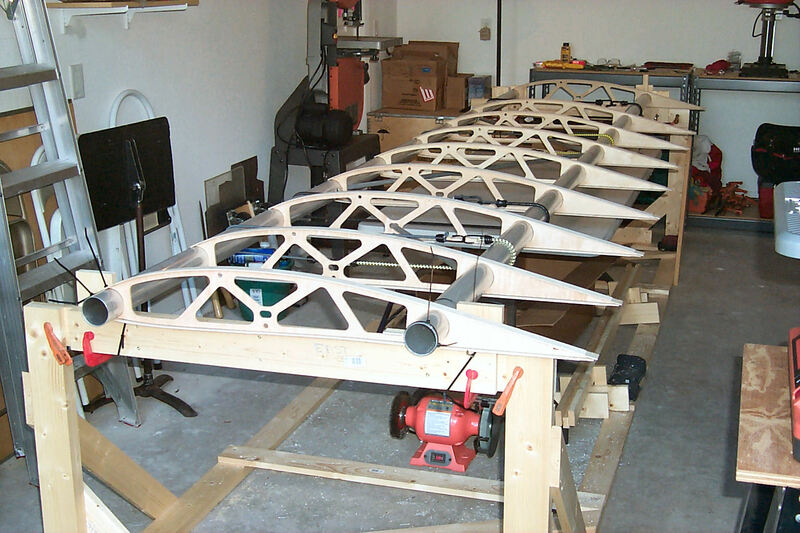 This is commonly done with a builder's log detailing the work that both Linda and I have contributed to the fabrication and assembly of the airplane. As work progresses it will be recorded on these pages. Knowing that other builders are always interested in photos I give to anyone who is interested, permission to copy any of the photos for their personal use. 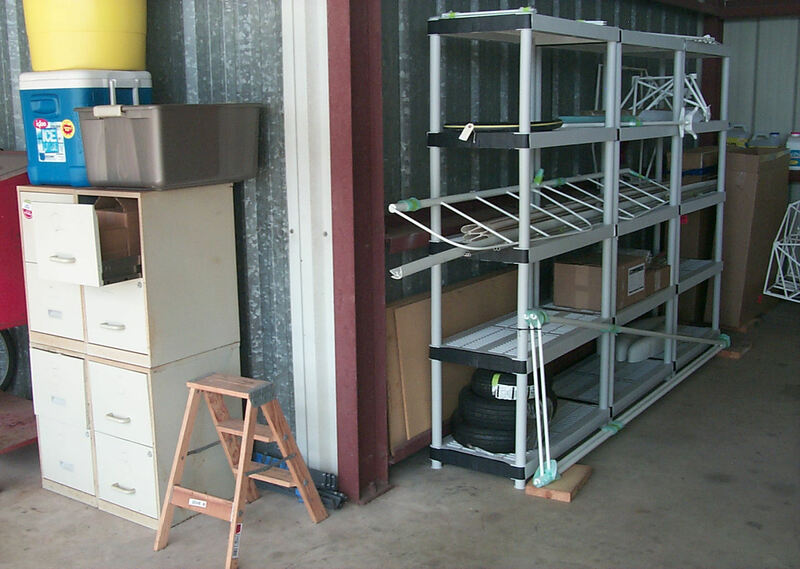 28 August to 4 September 2009: Kit inventory and storage. An important first step is to make a complete inventory of the kit and report any omissions to the manufacturer. 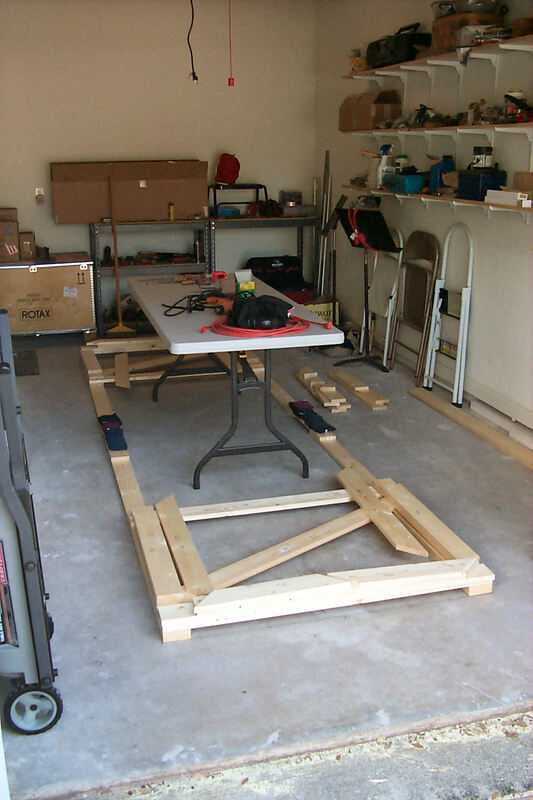 My plan is to build components of the airplane in my garage at home. 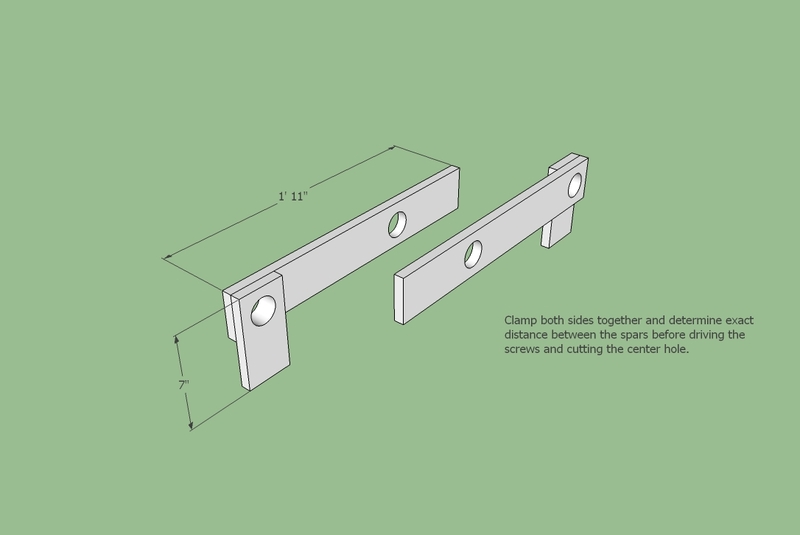 For this reason I've made a log of where each part is stored so that I can easily retrieve the parts for any one component and transport them to the house for assembly. I've commandeered some old file cabinets to store most of the small bits. 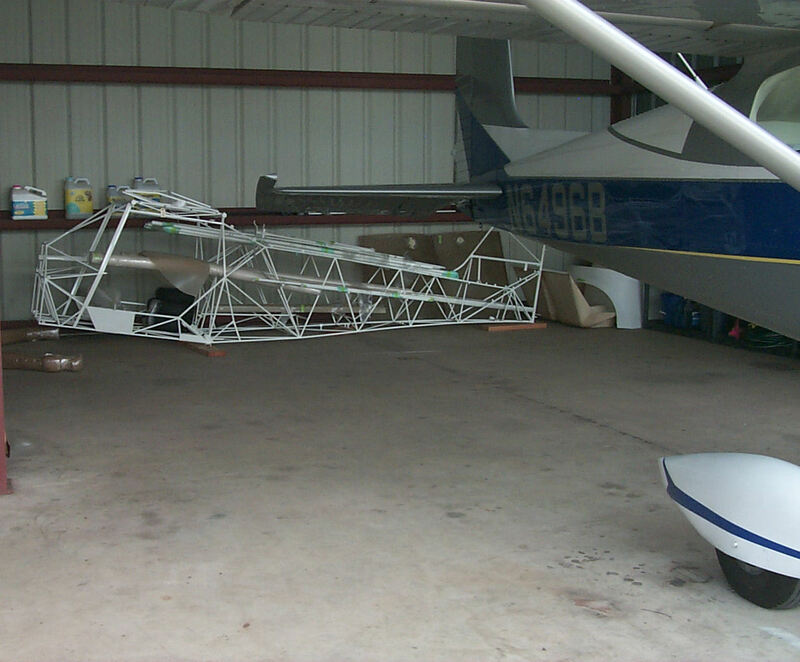 To avoid the chance of the shelving tipping over I zip tied them to the hangar structure. If you look close you can see that I've also zip tied the lift struts to the shelving. Years of calamities have taught me to be careful. 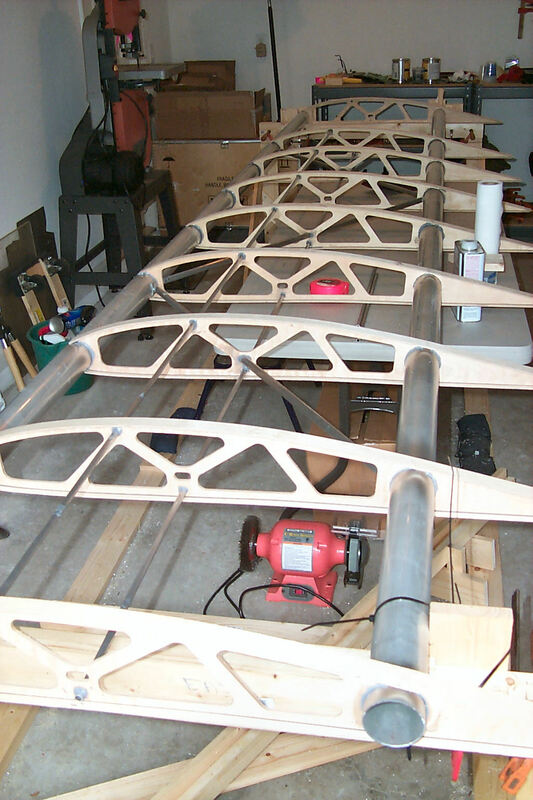 Wing Assembly: Kitfox offers an optional "quick-build" wing where much of the work has already been done for you. As unwise as this may turn out to be I did not purchase the quick-build option. I am saving some money but that is not the real reason that I'm doing it this way. I wanted to experience the challenge of building the wings from their component parts. I may end up regretting this decision. 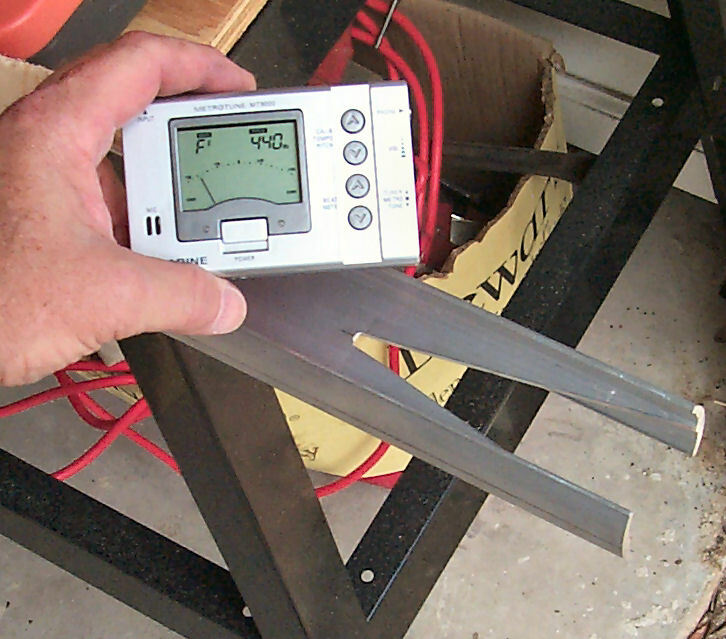 13 September 2009: I started laying out the exact location of the building jig. 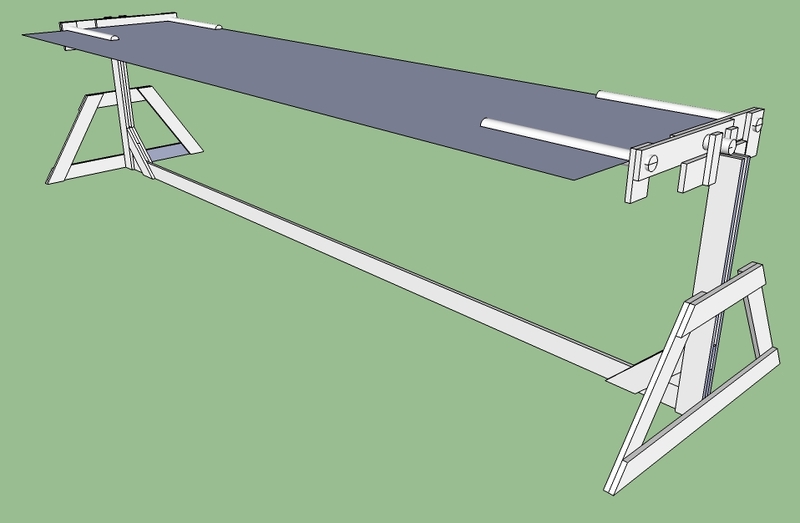 The drawing shows the jig and its location on the garage floor. As you can see, space is tight. 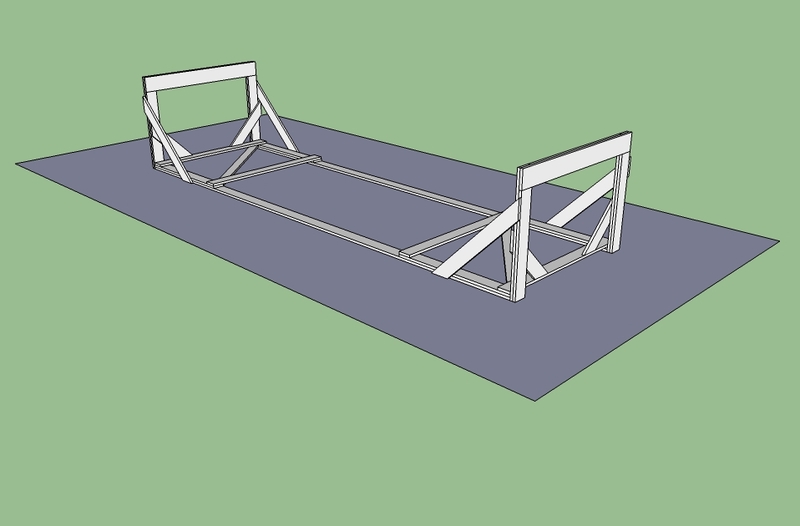 The drawing was made using a 3D modeling program available from Google known as SketchUp. I use the basic version, which is free. 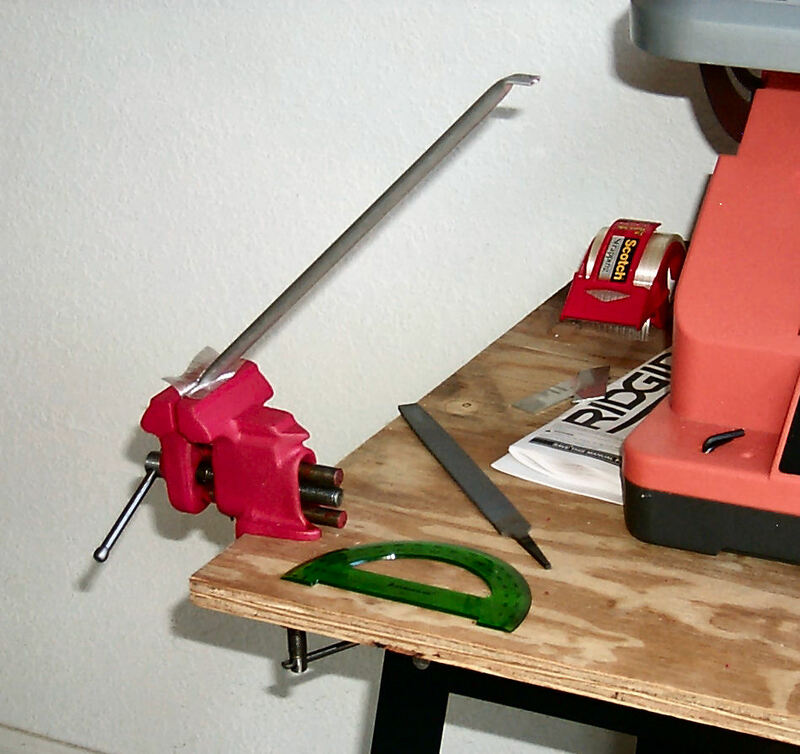 19-20 September 2009: I actually start cutting wood. 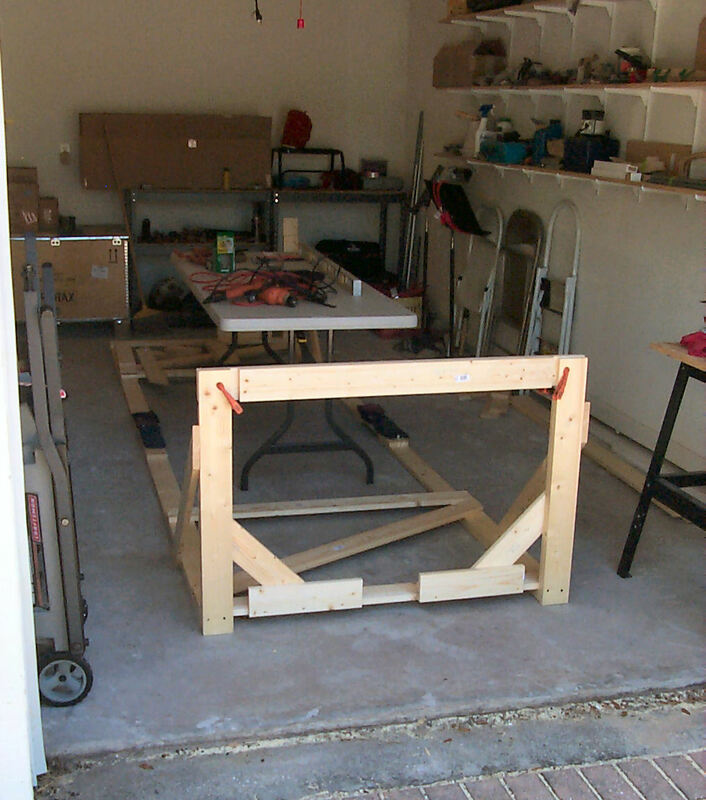 The building jig starts to take shape on the garage floor. I borrowed shot-bag scuba weights from my dive gear to help hold everything in position while I drive the screws. 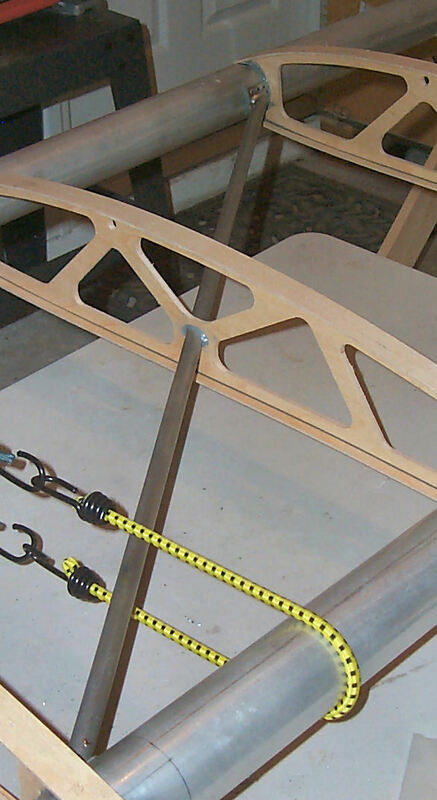 It's my plan to have the table in the middle of the jig while the wing is built over it. 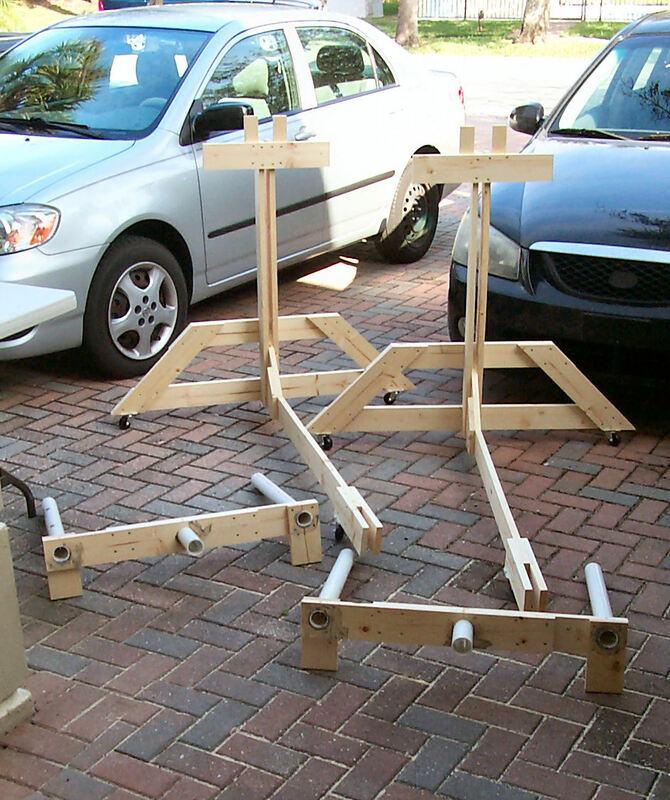 27 September 2009: The building jig is finished! 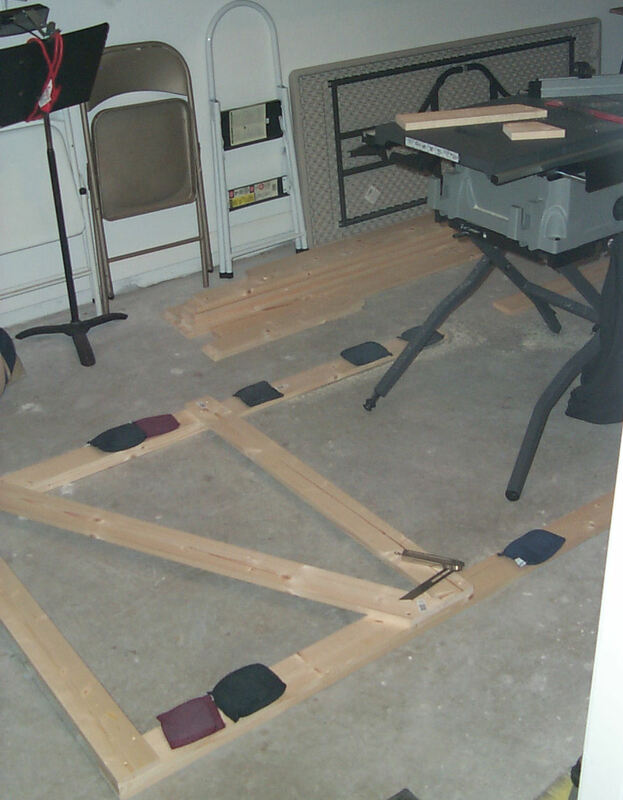 October 2009: I'm spending my available time acquiring tools and configuring the garage. It's tight but it will work. 12-16 October 2009: Cutting "Fish Mouths." 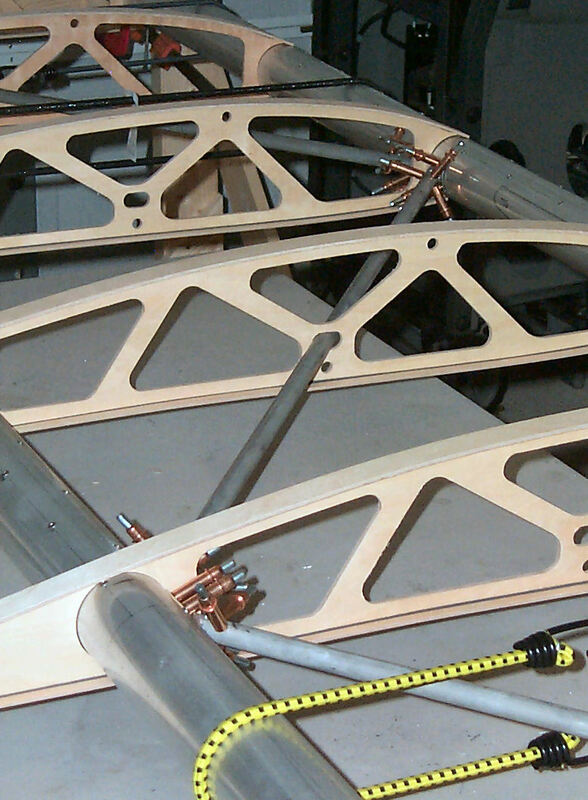 Each wing spar has a 60" I-beam insert to strengthen it in the way of the lift strut bracket. 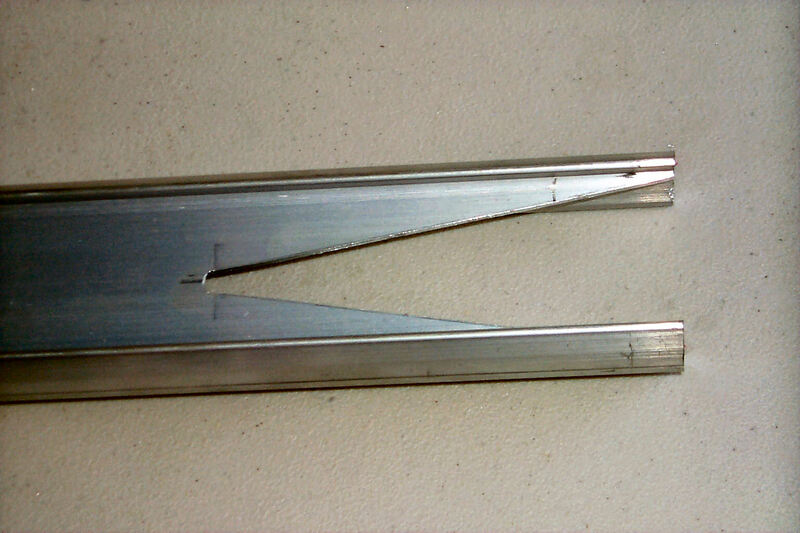 The ends are notched in order to avoid creating hard points along the length of the spar. 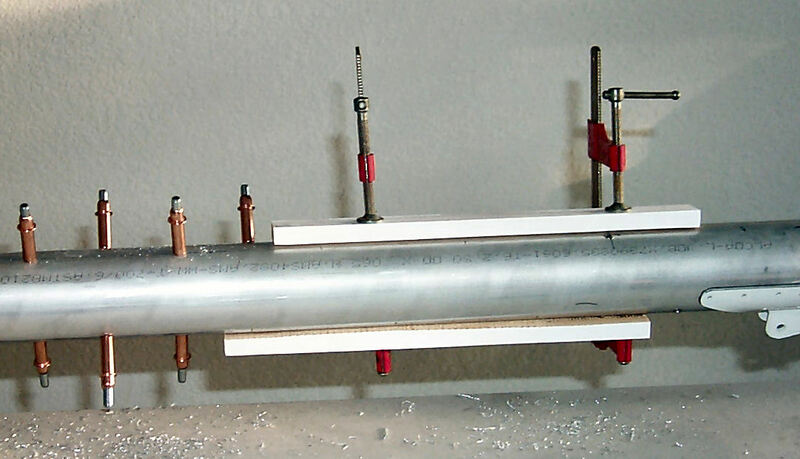 The inserts: The position of the hole is marked and a pilot hole is drilled. 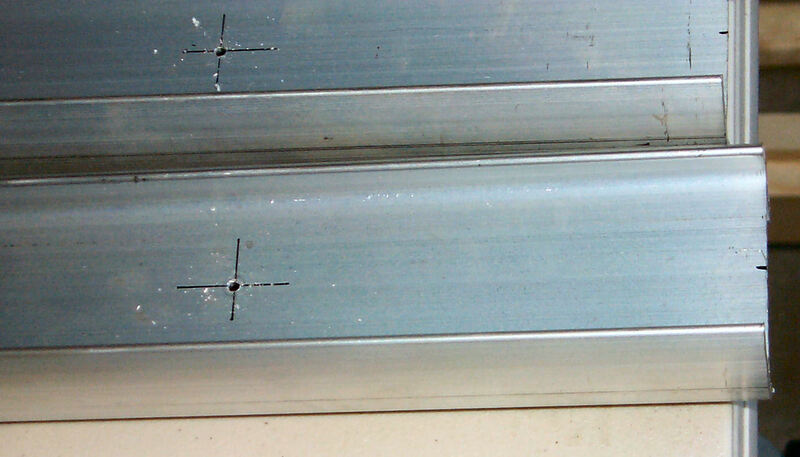 The hole is expanded to 1/4" and the cut lines are drawn. 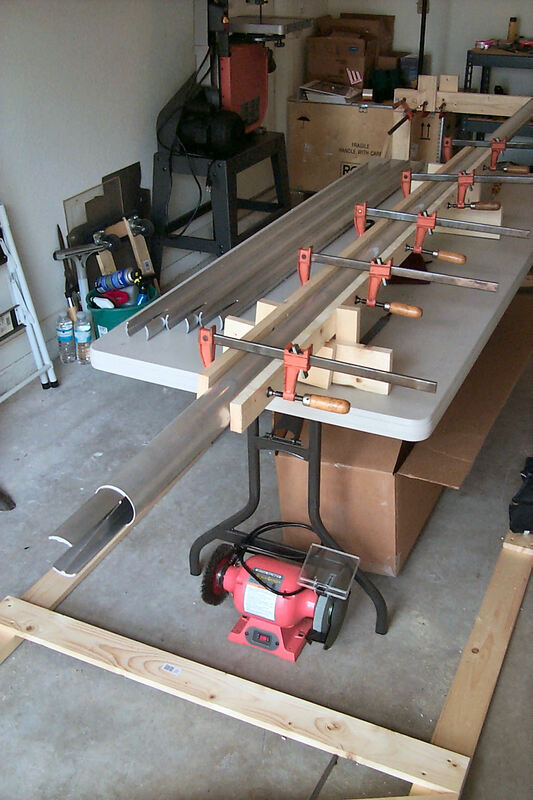 The cuts are made with a band saw and finished with a spindle sander and a file. 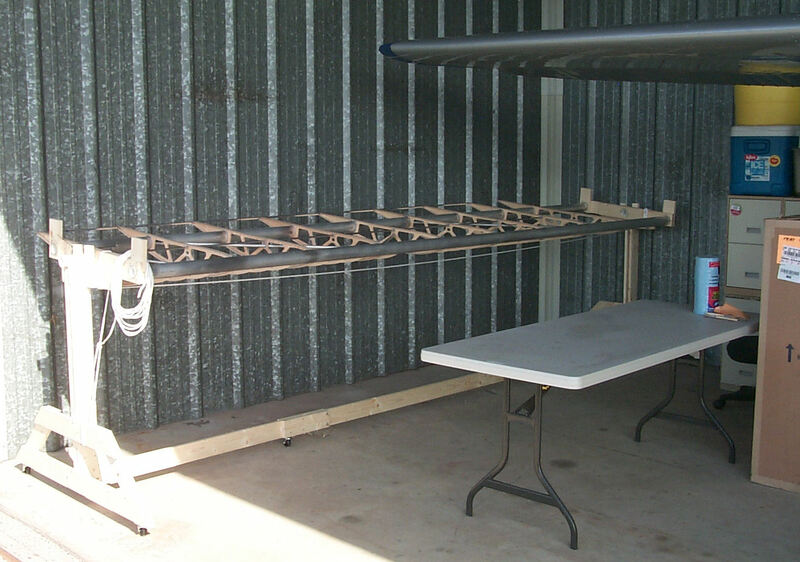 25 October to 11 November 2009: Assembling the wing spars. 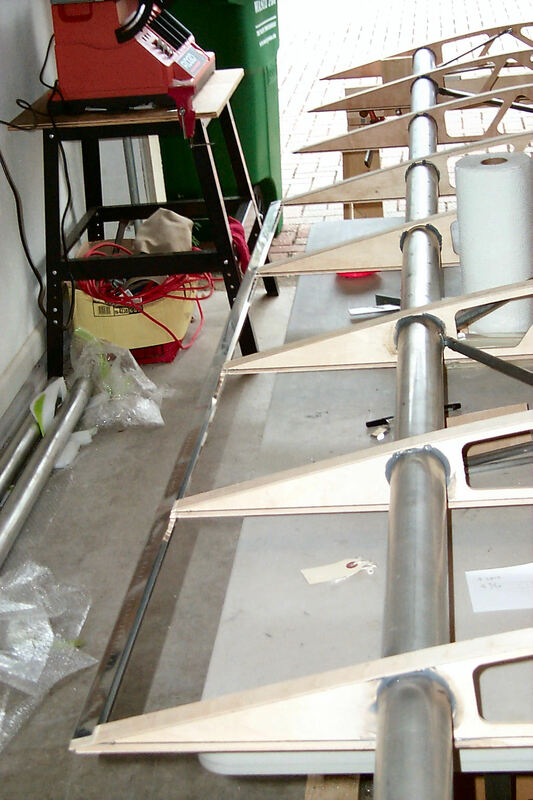 Placing the inserts into the spars. According to the Builders Manual I applied gentle pressure to the sides of the spar in order to slightly deform it and allow the insert to be easily slipped into the spar. 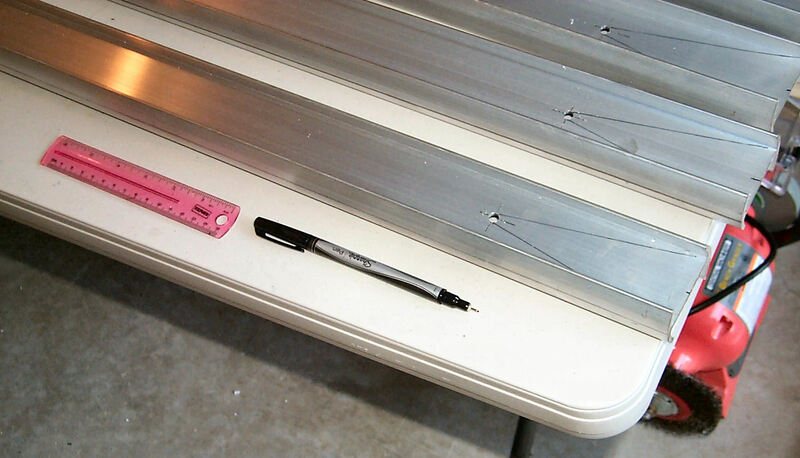 Marking the spar centerlines. 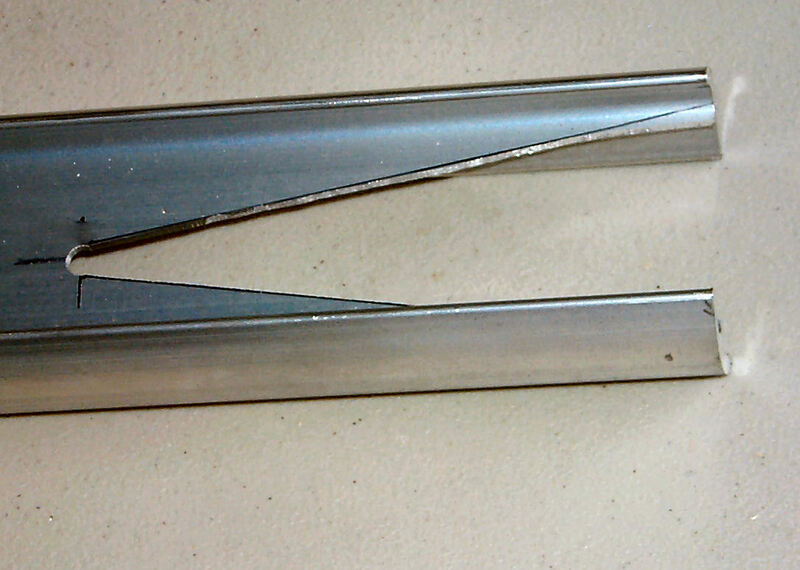 I first confirmed that the webs of each insert were vertical by sighting down each spar with a level and then dragged a straightedge over the top and bottom of the spars to mark the centerlines. Rivets! With gentle clamping I assured myself that no burrs will find their way between the spar and the insert then drill, debur, cleco, and rivet. From the middle photo you can see that I outlined the approximate position of the lift strut brackets to avoid driving rivets in that area. 13 November 2009, . 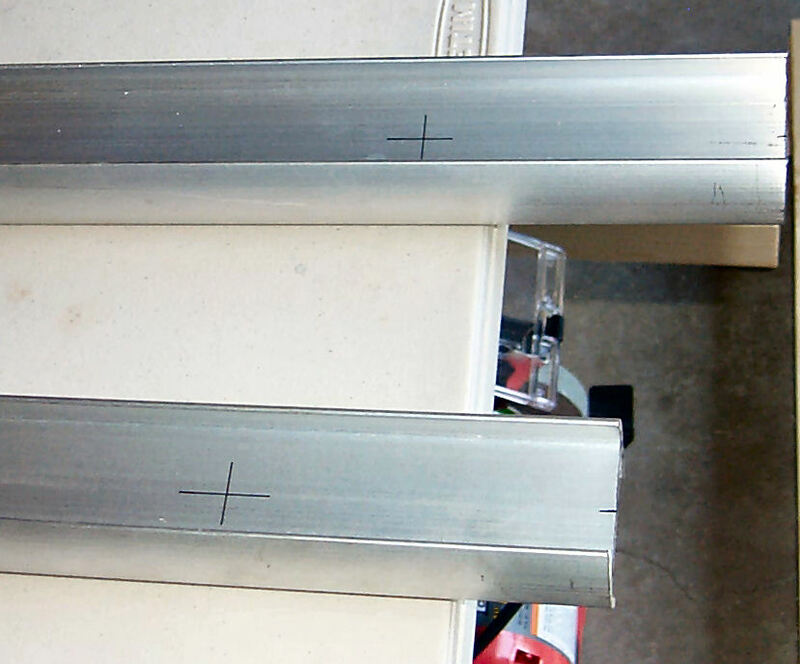 The brackets for the drag/anti-drag tubes come as a single piece that need to be cut into two pieces. 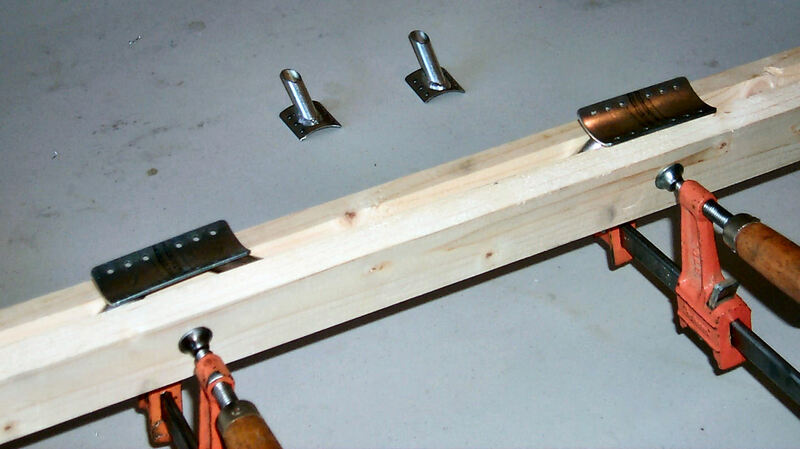 I used the jig that I constructed for "squeezing" the spar in the previous step as a clamping device to hold the brackets while I used a dremel tool to do the cutting. 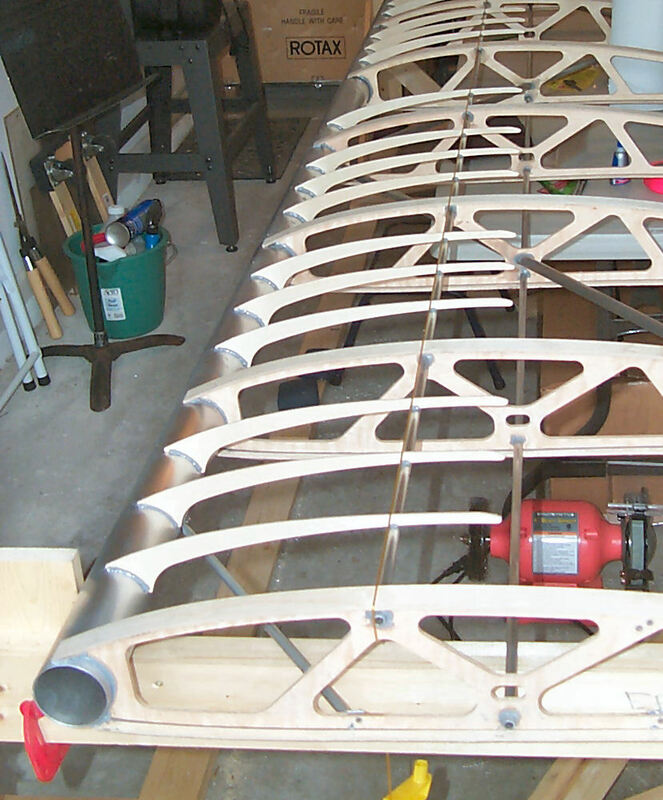 15 November 2009, Started building the Left Wing, dry-fitting the ribs and drag/anti-drag tubes. With a little effort the ribs slid into position. I then positioned a block at the root of the rear spar to extend it a 1/2 inch and then another 1/2 inch block under the rear spar at the tip. 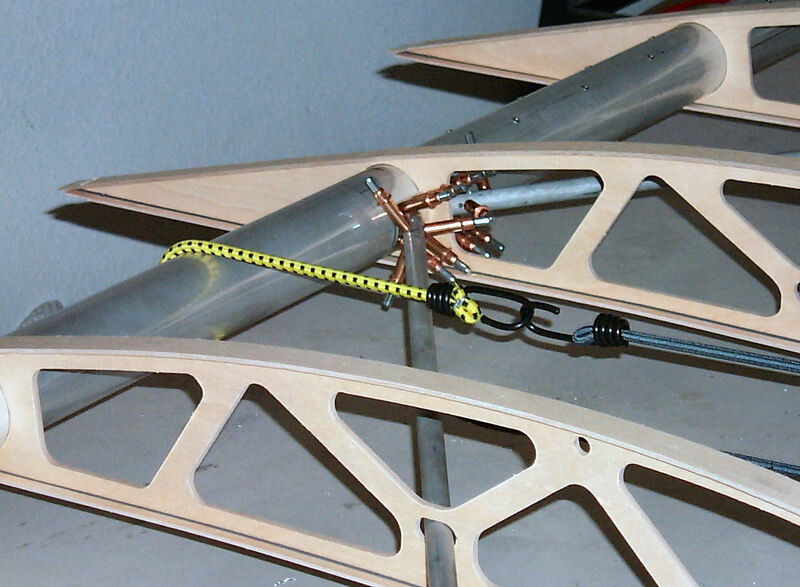 Among other things this assures proper twist or washout to the wing. 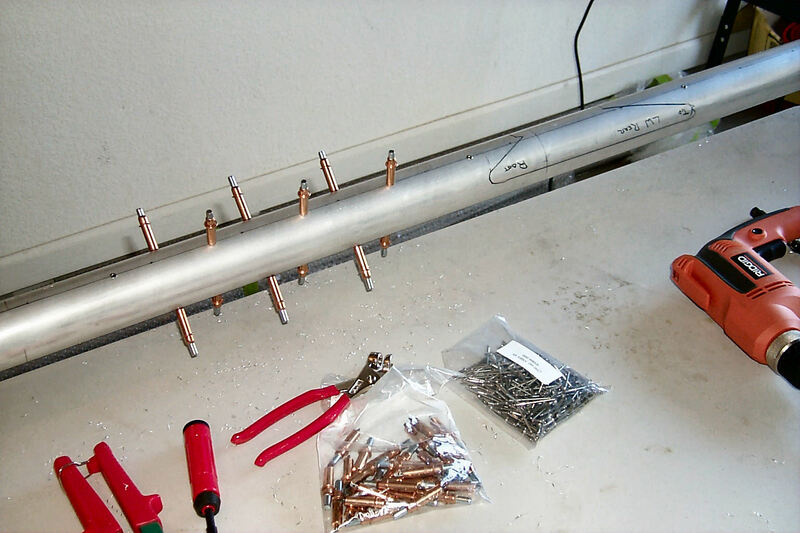 After deburring the drag/anti-drag tubes I placed them into position. I'm ready to begin the rather detailed process of permanently attaching everything. 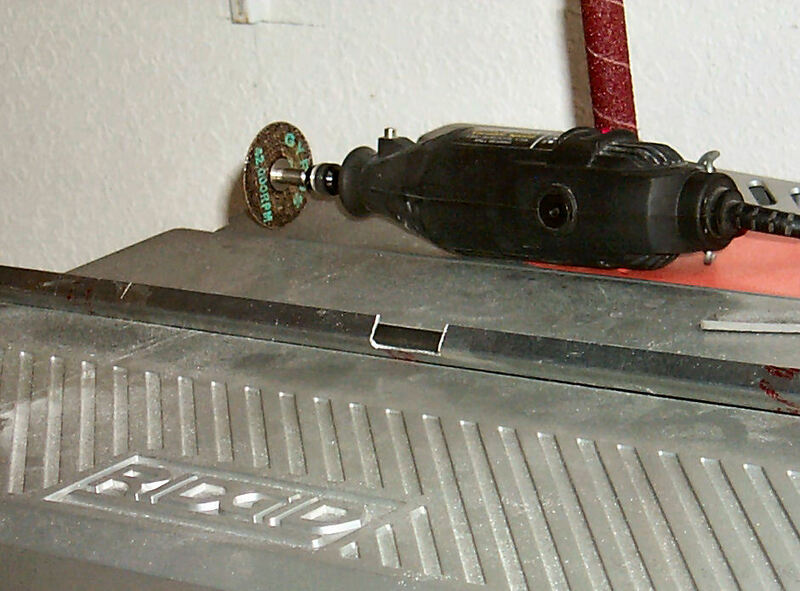 20 November 2009, drill and cleco. 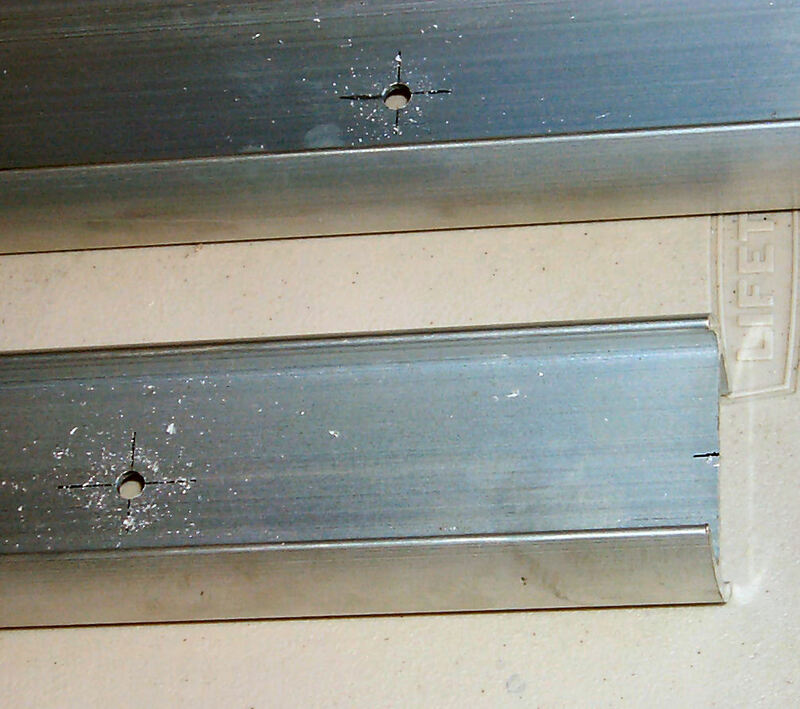 While I obsessively check my measurements I gather my resolve and start drilling holes for the drag/anti-drag brackets. 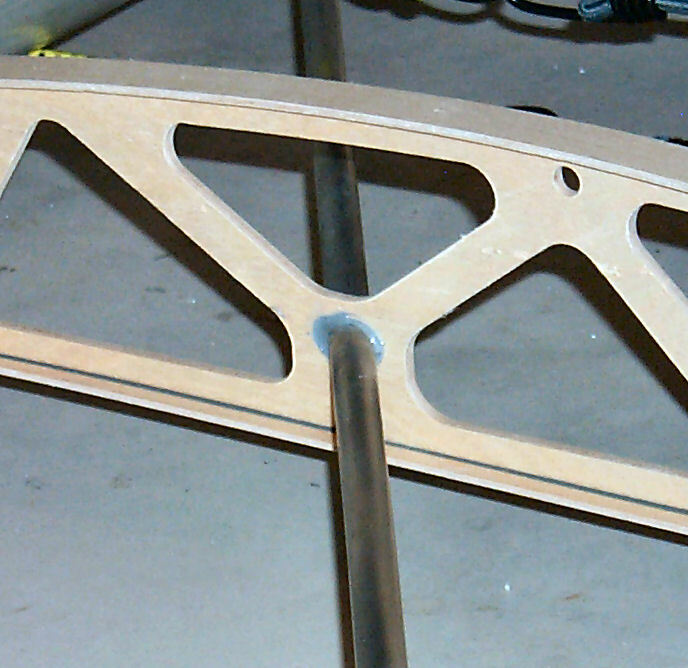 21 November 2009, all the rivet holes are drilled. the next step is to clean the surfaces for glue and rivets. 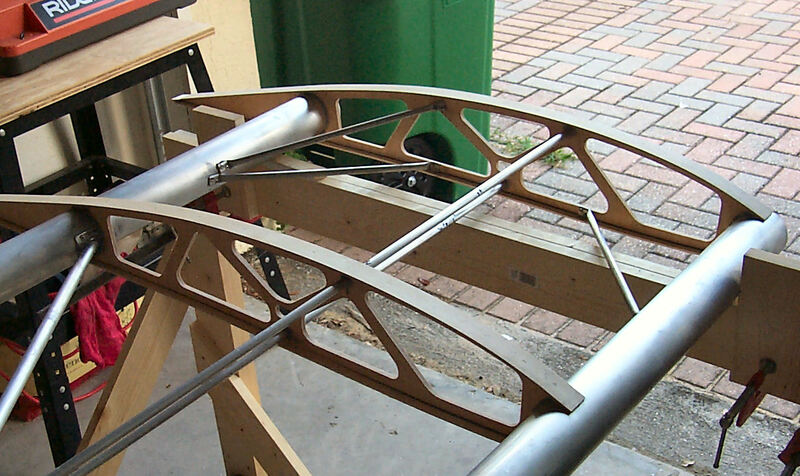 25 November 2009, Glue and Rivets! My first experience using Hysol and, of course, I mixed too much. I'm doing a little at a time. 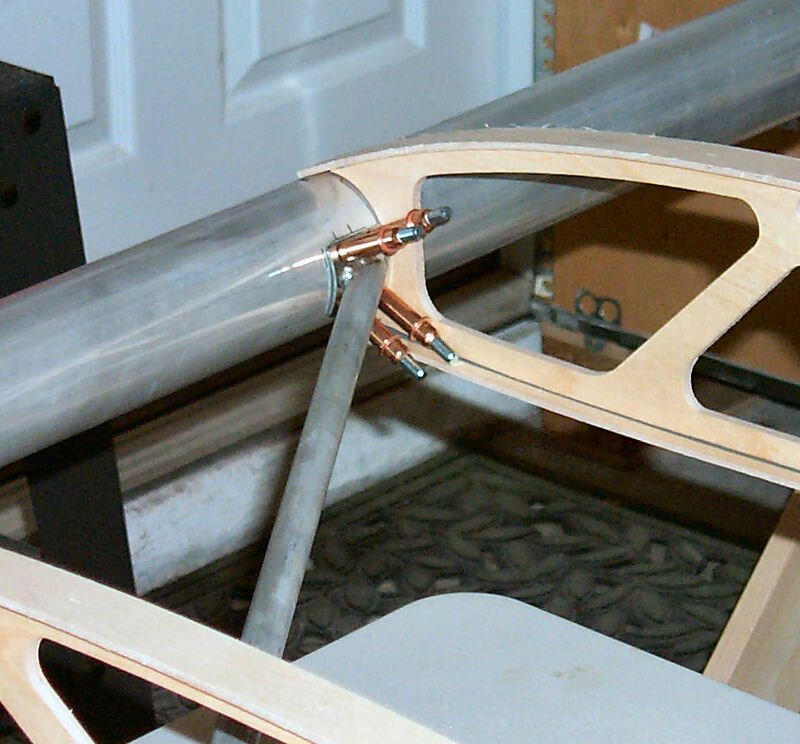 This time I glued and riveted the first drag/anti-drag tube and its brackets and glued ribs 3 and 4. 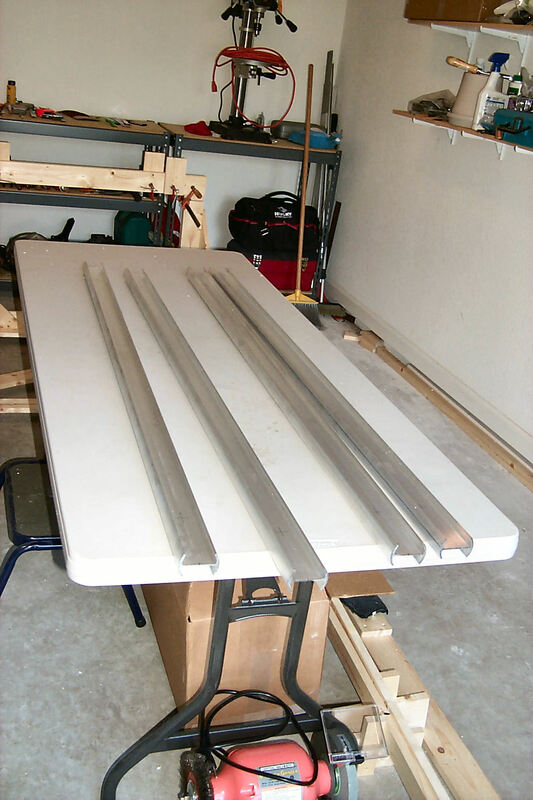 I just "tack-welded the ribs. I will do a proper epoxy filet joint later. 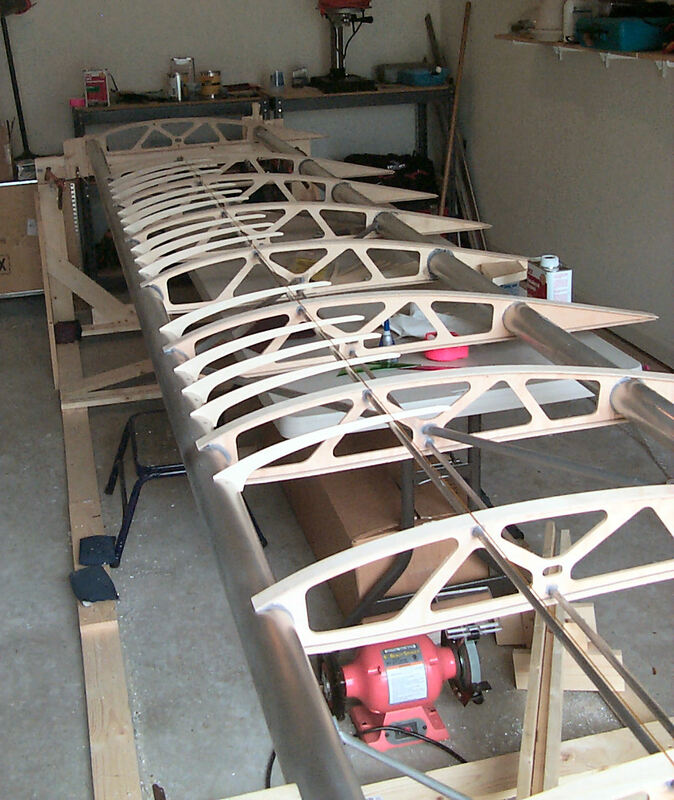 2 December 2009, Ribs 3 thru 10 are glued in place. 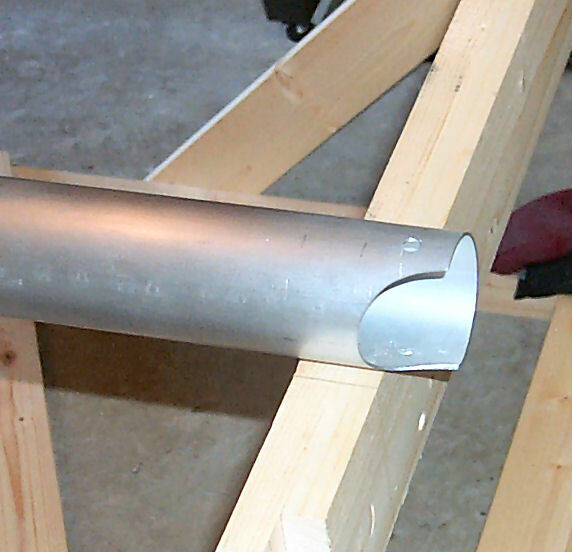 The drag/anti-drag tube are riveted in place, and the "tack-welded" places are filleted. 4 December 2009, Stringers! 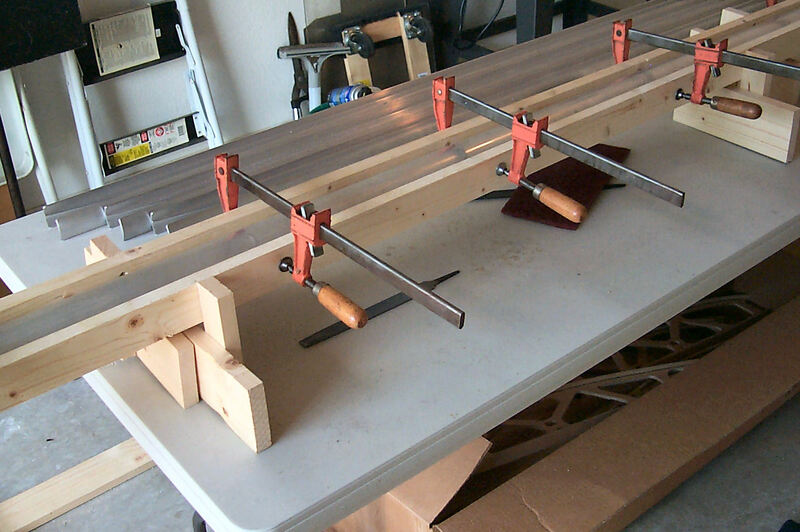 I cut the stringers to length and glued them in place. 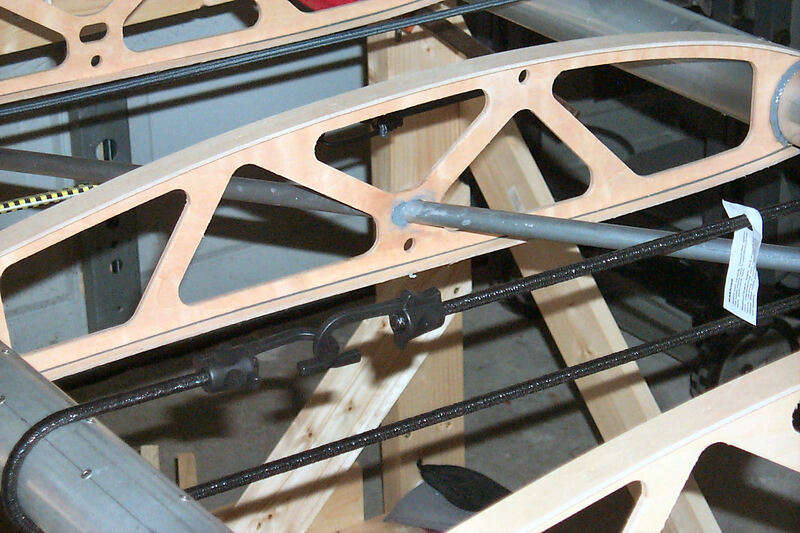 9 December 2009, End Rib Bracing. Both the root rib and tip rib need to be reinforced to resist the pull of the fabric covering. 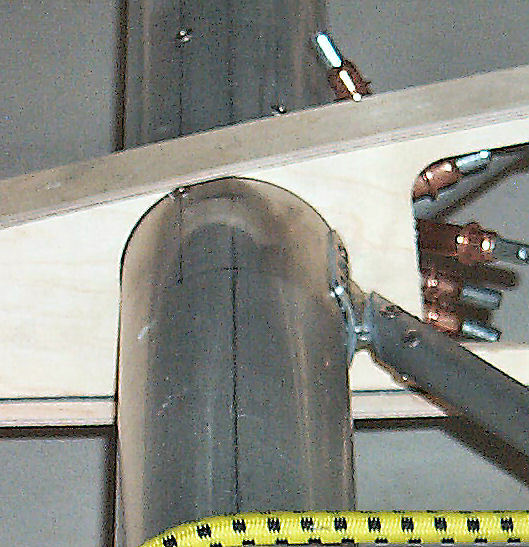 the root rib is reinforced by blocking between it and the fuel tank. 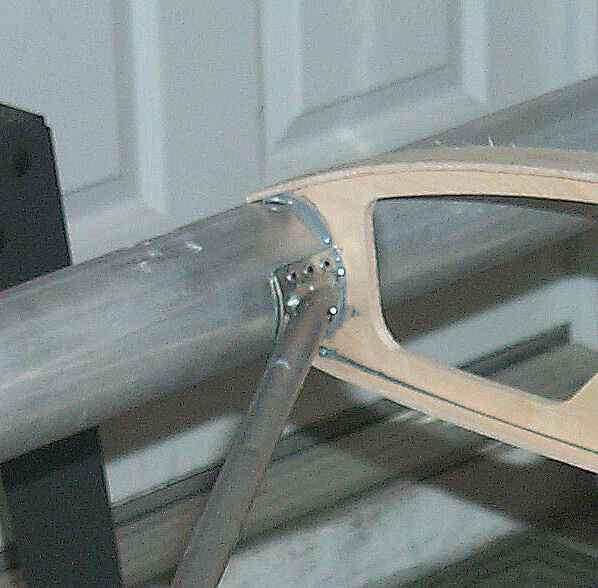 The tip rib needs bracing. Today I fabricated and installed this bracing. 10 December 2009, Upper False Ribs. After tacking them in place with super glue I permanently glued them with epoxy fillet joints. 11 December 2009, Trailing Edge. 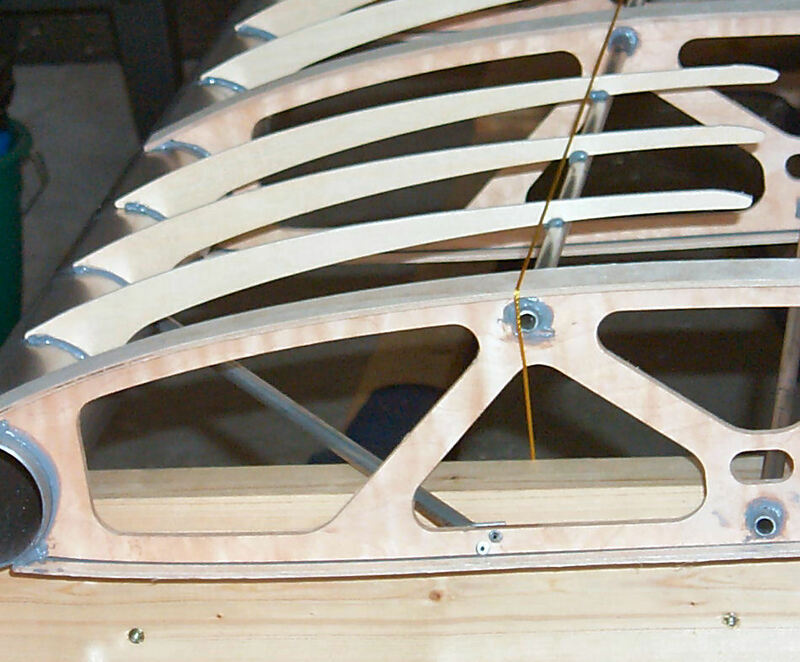 The trailing edge is made of sections that span 3 ribs. After making relief cuts for the ribs I dry fitted the sections in place. Once I was convinced that everything fitted correctly I glued them in place. The section that spans the distance from rib 1 to rib 3 was not installed. 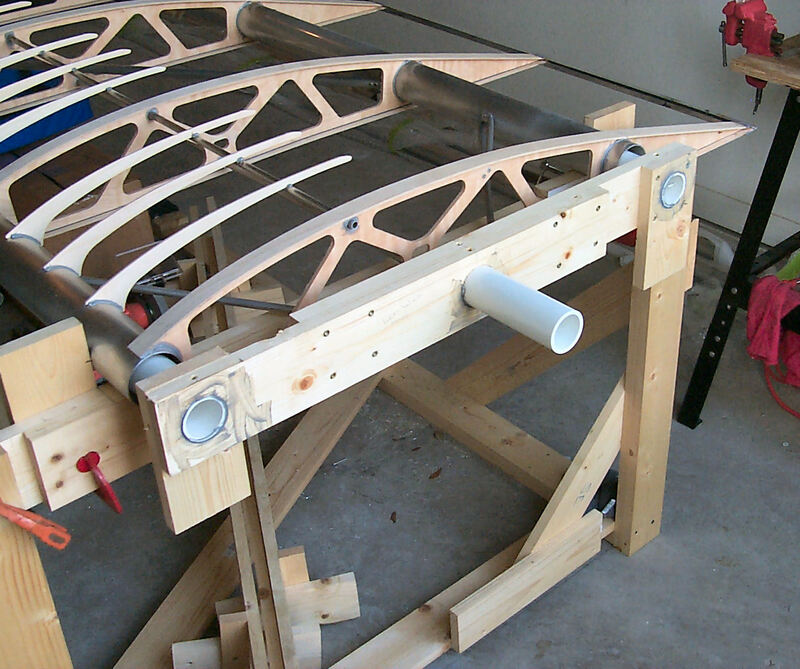 This has to wait until after the wing has been fitted to the fuselage and the fuel tank installed. 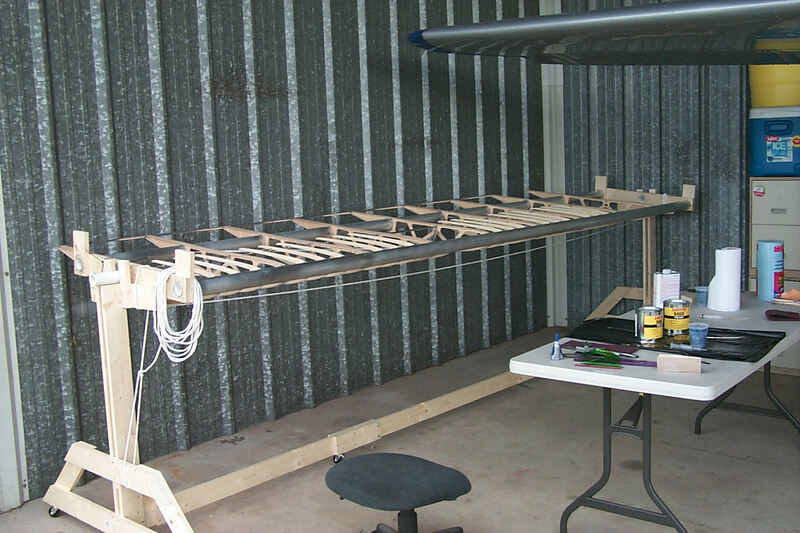 18 - 21 December 2009, Wing "Rotisserie" In preparation to transfer the left wing to the hangar I'm making a device that will easily allow me to turn the wing over. 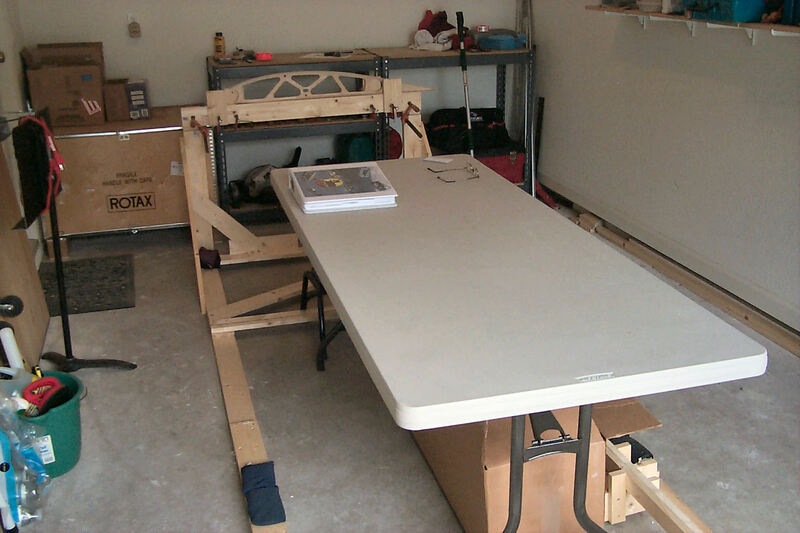 This will make it easier to do such things as covering and painting. 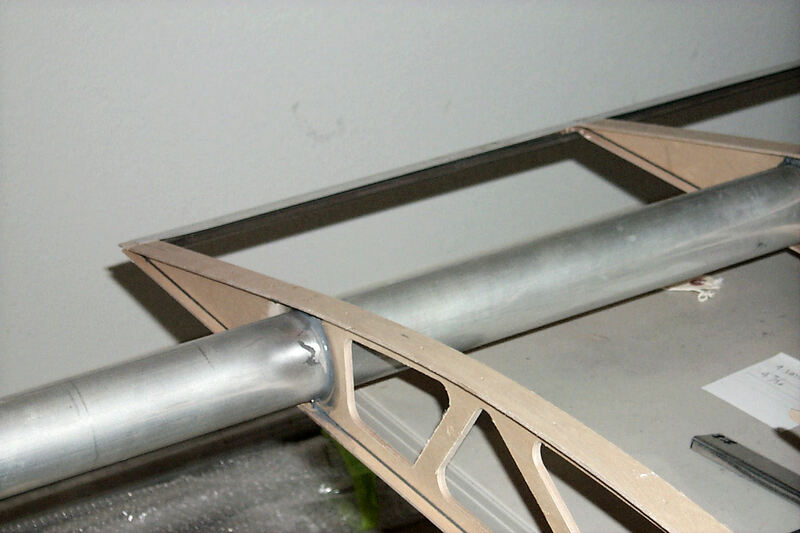 The wing is held by pvc pipes that extend into the tubular spars. 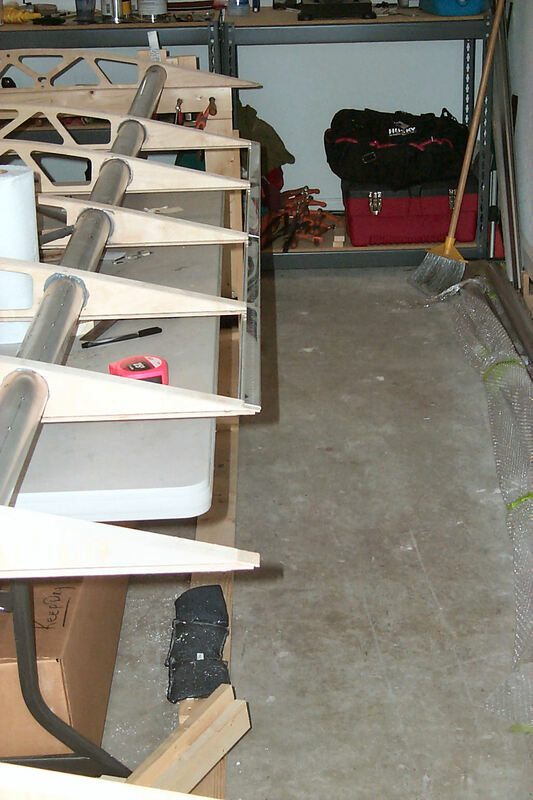 Once in the hangar I will attach the bottom false ribs and varnish all the wood. Added 9 January 2012: Construction drawings. 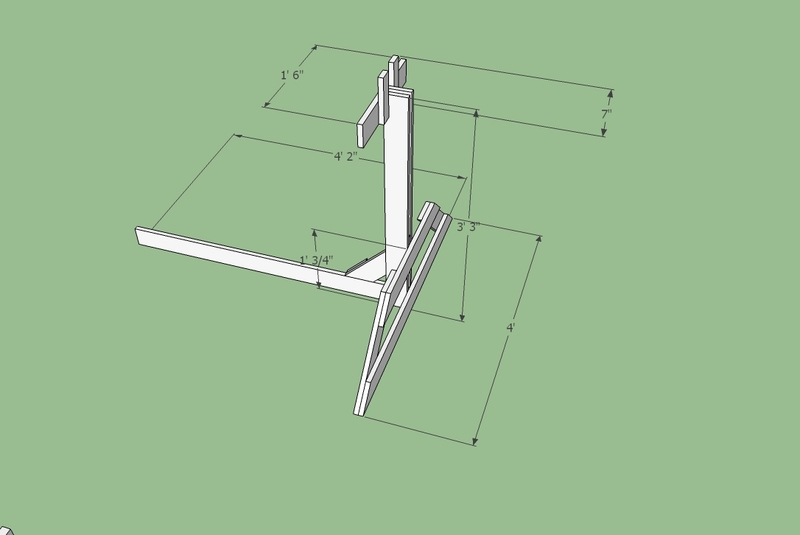 I occasionally get requests for the dimensions of my wing stand. 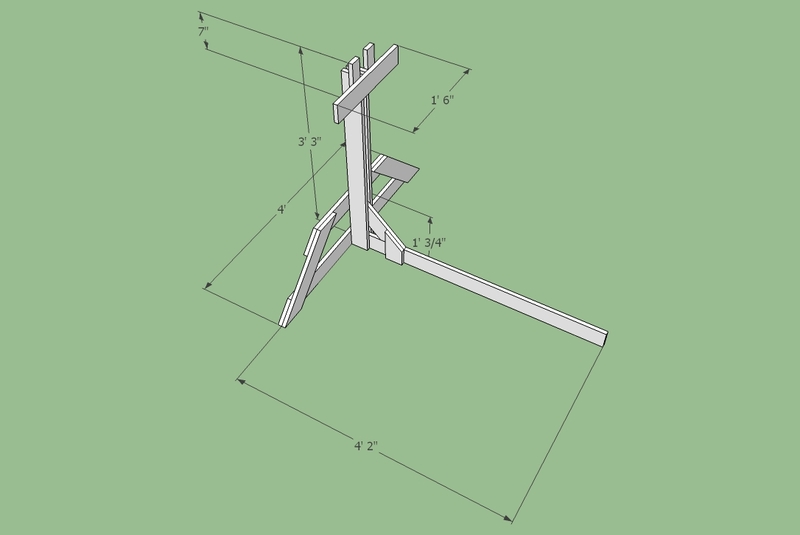 This should be helpful to anyone would like build one. 24 December 2009, Bottom False Ribs. I know it's Christmas Eve but Linda has a gig and, for the first time in many years, I don't. (Gig is musician talk for job.) 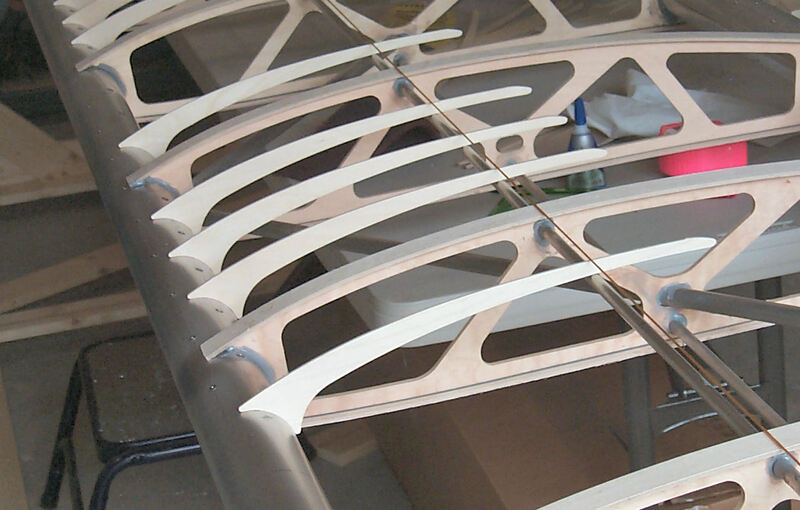 So, with Linda on her way to Ormand Beach I was free to go to the hangar and install the bottom false ribs. I know! The cowl of the Cessna is covered with smashed bugs, but, it was great fun flying in and out of our friends grass strip. 28 & 30 December 2009, Varnish. Linda helped me varnish all the wood on the left wing. 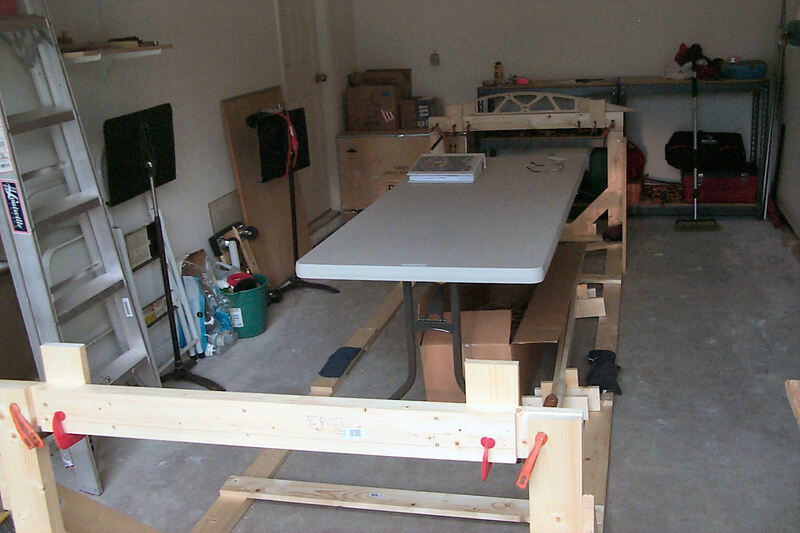 We used the Poly Fiber Epoxy varnish that was supplied with the kit. No photos; forgot the camera.